MEMPHIS, Tenn. (AP) The Memphis Grizzlies fought, rallied and were on the verge of snapping their losing streak, only to have an ill-advised foul lead to two successful free throws and another defeat. 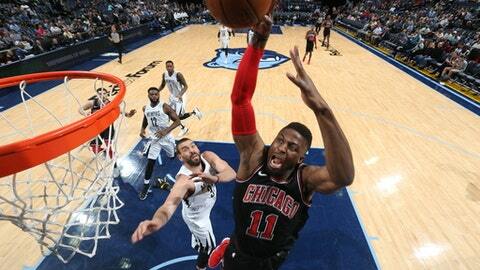 Chicago rookie Antonio Blakeney converted two of the three attempts with 1.8 seconds left Thursday night, allowing the Bulls to escape with a 111-110 victory – Memphis’ 19th straight loss. Blakeney got to the line after Grizzlies guard Tyreke Evans fouled him near the top of the key with Memphis leading 110-109 with 1.8 seconds remaining. The rookie from LSU made the first and the third free throws, providing the final margin. It was a game between two teams looking at the bottom of the standings. Both Chicago and Memphis are more interested in improving their chances of a top pick in this summer’s draft than wins at this point. But for Memphis, the misery is particularly frustrating. The Grizzlies have not won since defeating Phoenix on Jan. 29 and continue to hold the worst record in the NBA at 18-50. Memphis played its starters in the fourth, while Chicago was content to rely on its reserves. Despite erasing a seven-point deficit near the middle of the fourth, the Grizzlies simply couldn’t make the final play to end the losing streak. Evans had 25 points and nine assists for Memphis, while Gasol added 21 points and 10 rebounds. Jarell Martin scored 16 points and Green finished with 15 points and 10 rebounds. Bulls: Rookie F Lauri Markkanen missed his second straight game with lower back spasms. … The Bulls’ first basket was a 3-pointer from Robin Lopez, his fourth of the season. … The Bulls have allowed 22 of their past 23 opponents to reach 100 points. The other scored 99. … Have double-digit steals in six straight games. … The Bulls had 63 bench points, a season high for Chicago, and the seventh straight game where Bulls’ bench outscored the opponent’s reserves. Grizzlies: Dillon Brooks, who scored his career-high 29 points against Chicago on March 7, finished with 15 points. … Are now 0-9 against the Central Division. … The loss tied the second-longest losing streak in franchise history. The longest was 23 games from Feb. 16-April 2, 1996, when the team was in Vancouver. Bulls: Host the Cleveland Cavaliers on Saturday. Grizzlies: Finish a three-game homestand on Saturday against Denver.